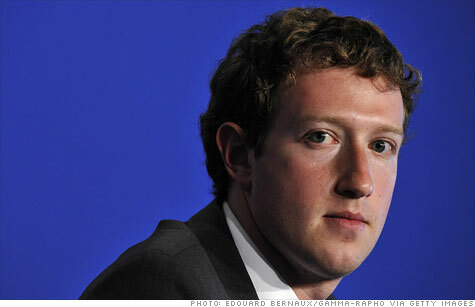 Investors have filed suit against Facebook CEO Mark Zuckerberg and underwriters of the IPO, including Morgan Stanley. NEW YORK (CNNMoney) -- Three investors sued Facebook and chief executive Mark Zuckerberg on Wednesday, along with lead underwriter Morgan Stanley and a host of other underwriters, accusing them of withholding negative information about the social network's initial public offering. "It appears as though material information was not disclosed," said Robert Weiser, one of the plaintiff lawyers in the class action suit. "We believe that the offering was conducted unfairly and it harmed public stockholders." The suit was filed in the U.S. District Court for the Southern District of New York in Manhattan. According to a report published by Reuters, Morgan Stanley (MS, Fortune 500) shared a negative assessment of the social network with major clients ahead of Facebook's (FB) IPO, which debuted last week. The lawsuit states that "certain of the underwriter defendants" were given estimates for how Facebook would perform in the second quarter and for the full year. The "revisions were material information which was not shared with all Facebook investors, but rather, was selectively disclosed by defendants to certain preferred investors and omitted from the registration statement and/or prospectus," the plaintiffs claim. A spokesman for Morgan Stanley declined to comment. "We believe the lawsuit is without merit and will defend ourselves vigorously," said a Facebook spokesperson to CNN. Other underwriters targeted by the lawsuit include Barclays Capital, Goldman Sachs (GS, Fortune 500), JPMorgan Chase (JPM, Fortune 500) and Merrill Lynch, a unit of Bank of America (BAC, Fortune 500). Spokespersons for Goldman Sachs and Barclays Capital declined to comment. Spokespersons for the other firms were not immediately available. 0:00 /1:14Would you pay to use Facebook? Weiser and his colleagues are representing Facebook investors Brian Roffe, Jacob Salzmann and Dennis Palkon. Weiser said that more plaintiffs may join the class action lawsuit. He said that monetary damages have yet to be specified. Anthony Sabino, professor at the Peter J. Tobin College of Business at St. John's University, said that it's hard to tell whether the suit has merit, because it's based on a single Reuters report. "It's still somewhat risky to peg an entire class action lawsuit upon a single news report," he said. But Sabino said that it could pay off, from a plaintiff's standpoint, "to be the first guy in" to start digging for information, in the hopes that concrete evidence of wrongdoing will emerge. On Wednesday, Congress got into the act. Senate Banking Committee started looking into Facebook's IPO. The Financial Industry Regulatory Authority and the state of Massachusetts are also scrutinizing the way the IPO was handled. Facebook's stock price finally rose Wednesday for the first time since its Nasdaq launch on Friday. Facebook was one of the most anticipated -- but also disappointing -- IPOs in recent history. On Friday, the first full trading day, the stock closed at $38.23 per share, just a hair above its IPO price of $38.